Damage Control: White House Issues Statements By Kavanaugh Pals Saying They Never Saw Him Black Out - Joe.My.God. The White House on Monday blasted out two statements from men who attended college with Supreme Court nominee Brett Kavanaugh, both of whom claim they never saw Kavanaugh black out from drinking. The White House released the statements from Dan Murphy and Chris Dudley, Kavanaugh’s former suitemate and classmate respectively, as a growing number of Kavanaugh’s old Yale University classmates have publicly accused him of mischaracterizing his drinking during the Senate Judiciary Committee hearing. 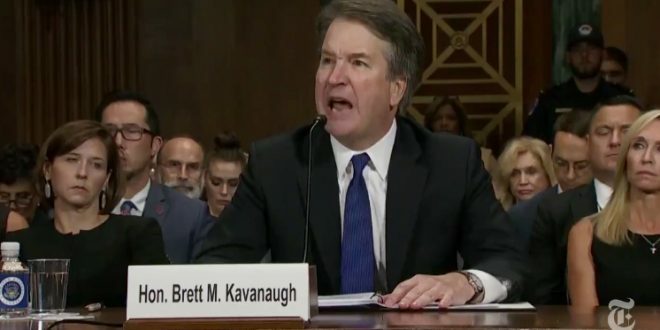 These classmates in interviews have accused Kavanaugh of being an aggressive and heavy drinker in college. Both Murphy and Dudley have defended Kavanaugh in previous statements to news outlets.